To all my American friends.....did you have a good holiday and yummy food? I do hope so! Well, let me start with my FO for this week. In between the working on my Secret Santa Goodies and my Pay it Forward Gifts, I did manage to get Jas's Cap done. I adore the texture of this piece. I knitted it in Drops Alpaca and I think it looks and feels great. It was also a really nice pattern to knit. Yip, isn't it wonderful, I received my Secret Santa parcel and isn't it a treat? Thank you so much to my Secret Santa partner Sara from This Life of Mine Plus 2, your gift is absolutely wonderful. 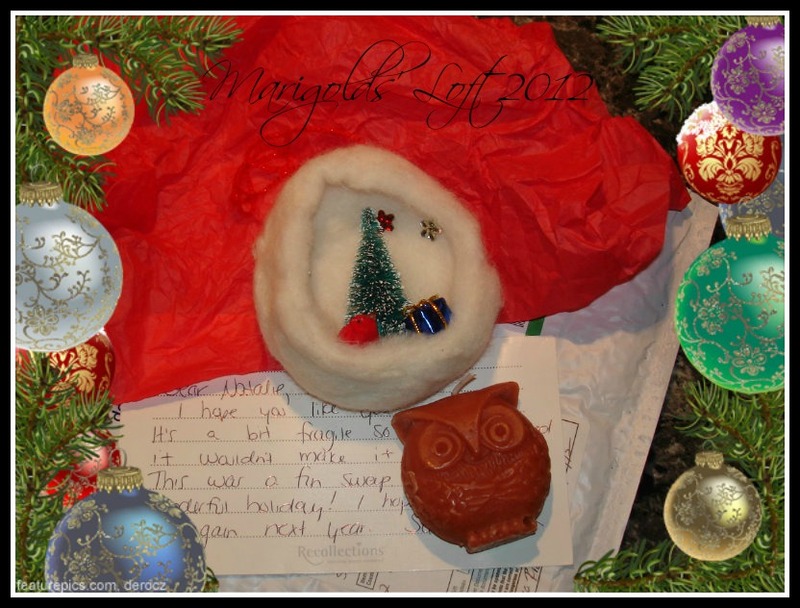 Your beautiful Ornament will have a very special place on our Tree and the owl candle is too cute. Your gift is on the way, hope you will receive it shortly. Once all of you have linked up I will do a round up post. Don't forget to come past on Monday for the next instalment of Filofaxiness, where I will share with you how I keep on top of my stash Filofax Style! I will be sharing over at Lindas and Tamis today. Super, I can't wait until all the posts start linking up! That cap does look lovely...of course, I am partial to anything Alpaca. Your Christmas exchange gift is great too. I have bought a couple more skeins of the yarn as it is beautiful, want to knit some more wrist-warmers and caps with it :) Your stuff must always be wonderful to wear! Oh I am so glad the ornament made it to you! Looks like it may need a bit of re-shaping but it traveled pretty well I would say. Thanks for posting! Pretty knit work again, Natalie! Hi Natalie. The hat is lovely. Its my color. Have a good weekend!